What if you could choose your heaven now? Go on a celestial shopping trip of sorts? Thirty-five-year-old Vivienne does just that, as she lies in the ICU; a fatal walk into the path of a truck. In her final week of life, Vivienne treks through the Heavens of a priest, a best friend, a homeless child, and a lover who never was. 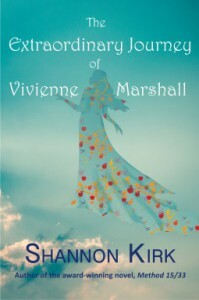 Vivienne's guardian angel, Noah, who may just be her soul mate, escorts her through selections of Heavens and through the confusion Vivienne experiences as she flounders between a doubt of life and the certainty of death. Although her visits to varied afterlives provide peace and beauty, choosing proves not so easy: Vivienne's love for her young son and her earthly father pull her from her colorful journey—and from the divine love of Noah. I wasn't quite as in love with this book as I expected that I'd be. While I still enjoyed the concepts of love and eternity this made me think about, I wasn't completely excited about the way this seemed to promote an idea of there being one true love, and I really didn't like how people could only be in one other's heaven at the same time.I really enjoyed the characters the author created in this book. Vivi chose to visit the afterlifes of people who might not necessarily be obvious choices, but they were heartwarming choices and definitely made me think about the impact that people can have on others, even in the smallest of ways. Vivi's family seems to be riddled with entirely too cute love stories--those perfect relationships featuring people who met in their childhood and stayed together for years. While I do adore these, I felt like they were almost perpetuated too much. I love the idea of true love, but I don't enjoy the idea that one can only have one great love in a life time; it's limiting. This was told from varying perspectives which I found to be a little confusing at points as I got lost as to who each character was in relation to Vivi, but this was probably due to my not being entirely invested in this book. I felt like it could have been more focused, although I did enjoy seeing what happened after Vivi's eventual passing and being able to be omniscient in that sense. This book definitely had a brilliant premise. I was reminded a little of Mitch Albom's The Five People You Meet in Heaven. I just feel like I didn't entirely click with the way it was executed. However, I recommend this to people interested by the blurb.